The Graduate Group in Microbiology offers a Doctor of Philosophy degree program in microbiology. This Ph.D. program combines academic and experimental training in modern molecular approaches to microbiological problems. Time for completion of the program varies depending upon the student, but is typically 5 1/2 to 6 years. The goal of the Ph.D. program is for the graduate student to present a dissertation that makes an original contribution to the body of microbiological knowledge. In the process, the group strives to give the student the opportunity to develop the skills and fundamental knowledge to become an independent investigator in academia, industry, health care or government. The Graduate Group in Microbiology admits students only for the Ph.D., although occasional students who elect not to complete it may choose instead to satisfy the requirements for the M.S. degree. Investigating the impact of conversion of the Amazon Rainforest to pasture on soil microbial communities (Photos provided by Jonathan Lin from Rodrigues Lab). 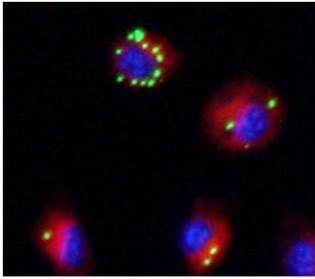 Mouse macrophages infected for 8h with Brucella abortus (Blue: nuclear stain, Hoechst; Red: Lysosomal protein LAMP-1; Green: Brucella expressing green fluorescent protein. Photo by Christelle Roux, Tsolis Lab). Induction of colonic crypt hyperplasia in mice infected with the attaching and effacing pathogen Citrobacter rodentium (Left panel: uninfected; Right panel: infected). The Ki67 proliferation marker in pink shows dividing cells, and cell nuclei are stained blue (Photo by MGG Graduate Chris Lopez, Bäumler Lab).